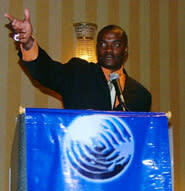 Rodney Allgood is an entrepreneur who founded is first business at the age of 22 on the island of Maui in 1990. He has since launched several successful businesses, and has found that the main ingredient for his success has been the mindset and attitude that he keeps, as well as the power of his thoughts. Since 2005, his has shared his success strategies with others who are bold enough to pursue their dreams. He has been a keynote speaker at conventions and meetings throughout the country. He is also the creator of a seminar called mindSHIFT 360, which is designed to assist us to break through our mental limitations that we impose upon ourselves. Rodney has a passion for helping others re-discover that special gift inside of themselves that make them unique and special, that quality that holds the seeds of greatness. By coming to understand how the mind actually works, we can them start to take control of our thoughts, dreams and ideas, and create the life that we truly want to live. You Were Created to THRIVE, Not Just Exist! Nerium International, State of Hawaii DOE, East Oahu Realty, Event Attainment, Inc., Mind Lab Stimuli, Petra General Contractors and many network marketing companies across the U.S.